January 19, 2016, 12:12 PM · In an effort to promote the coverage of live violin performance, Violinist.com each week presents links to reviews of notable concerts and recitals around the world. Fabio Biondi performed "Chiara’s Diary: A Life at the Pietà Orphanage in Venice, 1730-1770" with Europa Galante. The New York Times: "Mr. Biondi, in his various accounts of the Pietà, both narrows and broadens the context, simultaneously sketching the life story of one of the foundlings, Chiara, and noting how musical activities at the Pietà reflected the larger shift in Europe from complex Baroque toward streamlined Classical styles." Fabio Biondi. Photo by Emile Ashley. Leonidas Kavakos performed Dutilleux's "L'Arbre des Songes" with the London Symphony Orchestra. The Guardian: "The kaleidoscopic orchestration of L’Arbre des Songes, which takes the enchanted forests of Arthurian legend as a metaphor for human imagination, glowed with a heady intensity: Leonidas Kavakos was the soloist, superbly articulate and incisive, yet rapturously lyrical." The Arts Desk: "Leonidas Kavakos has played the work in recent years with the LSO under its previous music director, Valery Gergiev. Now afforded the backing of superfine textures conjured by Rattle’s direction, he was more eloquent than ever." Evening Standard: "The work is effectively a violin concerto and Leonidas Kavakos proved an eloquent soloist." The Telegraph: "The soloist Leonidas Kavakos played with soaring lyricism." Frank Peter Zimmermann performed Lindberg's Violin Concerto No. 2 with the New York Philharmonic. The New York Times: "Mr. Zimmermann aced that cadenza, a true test of virtuosity. (In a later, smaller cadenza, the concertmaster, Frank Huang, was an effective foil to Mr. Zimmermann.)" New York Classical Review: "Technically stunning, the concerto engaged soloist Frank Peter Zimmermann and various sections of the orchestra in intense dialogues that sometimes felt unattached to any larger narrative." Daniel Hope performed the Korngold with the National Arts Centre Orchestra. Ottawa Citizen: "Daniel Hope was a persuasive salesman for Korngold’s irrepressible, cinematic violin concerto. Hope and Shelley have recorded the work together and their camaraderie created a lively party atmosphere. Hope, who plays a magnificent 1742 Guarneri Del Gesu, has a fat, buttery sound, spectacular left-hand facility and a silky musicality that makes no apologies for Korngold’s umabashedly romantic score." Yevgeny Kutik performed in recital with pianist and composer Timo Andres at the Phillips Collection. Washington Post: "...the violinist may have reserved his most insightful playing for the premiere of 'Words Fail,' a one-movement 'song without words' he commissioned from Andres last year....From a descending lament, the work slowly gathers power through overlapping variations, becoming darker, more ambiguous and more complex before building to a soaring climax. Kutik and Andres gave a persuasive, deeply thoughtful reading to this involving new work." Pinchas Zukerman performed the Beethoven with the Royal Philharmonic Orchestra. Chicago Classical Review: "The violinist glides unruffled and disengaged across the surface of Beethoven’s most profound concerto as if suavity is the main point of the exercise. In addition to the generalized interpretive approach, Zukerman’s playing wasn’t nearly as technically polished as usual, with repeated wayward intonation and off-center attacks, usually at the beginning of phrases." Chichester Observer: "All this and more within intense music Gibbons and Benedetti took surging from screwed-up tension out of chaos - through swirled-up dissonant tension in the central solo violin cadenza – bursting towards a sunrise-like passage that elevated everything - to a finale of whirled-up dancing tension release." Michael Ludwig performed the Glazunov with the Orlando Philharmonic. Orlando Sentinel: "Glazunov's expressive concerto was as soothing as a cradle song. Ludwig created a perfect blend of sweetness and urgency and not even for a moment let his playing turn shrill." Tim Fain performed Glass' Vi­olin Con­certo No. 2 with the Pitts­burgh Sym­phony. Pittsburgh Post-Gazette: "His quiet, un­sen­ti­men­tal take on the main theme of the sec­ond move­ment car­ried that mel­ody like a breeze. A heav­ing vi­brato closed the move­ment, punc­tur­ing its early tri­umph with sobs. With a quick­sil­ver bow arm, the vi­o­lin­ist of­fered equal fa­cil­ity in the rol­lick­ing syn­co­pa­tion of the fi­nale, which seemed to elicit the ver­dant fer­til­ity of spring." Pittsburgh Tribune-Review: "The concerto is almost invariably appealing in the moment, usually with a rhythmically urgent accompaniment. Although there are some passages that are boring, there is a bigger problem in this 40-minute piece. Even the best of it, such as the opening of the second movement, soon sounds like a transition to better music that never arrives. Violinist Tim Fain gave an ardent performance, playing with plenty of energy, intensity and tonal variety. Konig led an assured accompaniment. The musicians received a standing ovation." Alexander Kerr performed the Walton with the Dallas Symphony Orchestra. Theater Jones: "Kerr flawlessly negotiated all of the mind-numbing virtuoso demands, many of which are awkward on the instrument, without apparent strain. Intonation was equally excellent. Further, he brought more musicality to the concerto than is usually heard." The Dallas Morning News: "DSO concertmaster Alexander Kerr was the soloist, playing with great musicality as well as technical aplomb." Baiba Skride performed Prokofiev's Violin Concerto No. 1 with the National Symphony Orchestra. The Washington Post: "Skride is a tight, clean player who responded almost too well to Jarvi’s phlegmatism. Prokofiev’s first concerto is filled with singing lines and crystalline passages in which the violin is held aloft on tremolos from the other strings; Skride was so clear and limpid that the effect was sometimes muted." Itzhak Perlman performed works by Mozart with the Los Angeles Philharmonic. The Los Angeles Times: "These performances were the closest I've heard to prime Perlman in years." Congratulations to American violinist Anthea Kreston, who was selected from 10 candidates to join the Berlin-based Artemis Quartet as its second violinist. 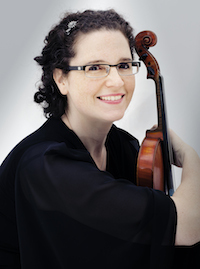 Kreston, who has played in the Amelia Trio since 1999, has a bachelor's degree Women's Studies from Cleveland State University, a master's degree from the Hartt School of Music and a performance degree from the Curtis Institute of Music, where she studied with Felix Galimir and Ida Kavafian. She has taught at Hartt, Wesleyan University, and Willamette University. 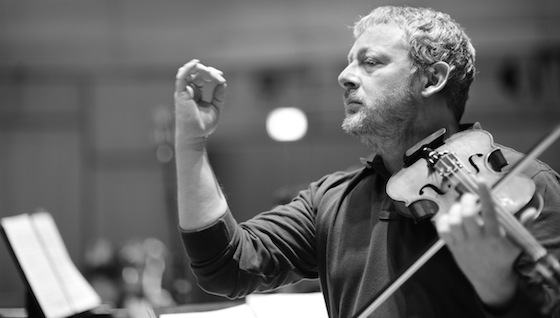 Kreston will replace Gregor Sigl, who will now play viola in the quartet, following the death last summer of violist Friedemann Weigle, who was 53. Other members of the quartet are violinist Vineta Sareika and cellist Eckart Runge. The Artemis Quartet was founded in 1989 at the University of Music Lübeck and its members also teach at University of the Arts Berlin and Chapelle Musicale Reine Elisabeth in Brussels. Violinist Rennosuke Fukuda, 16, first prize winner in the 2014 Menuhin Competition junior division, will perform a recital at the World Economic Forum in Davos, Switzerland on Thursday. He will perform at the World Food Programme "World Leaders" event, hosted by the UN Secretary General Ban Ki-moon. He will be accompanied by the Menuhin Competition's Artistic Director, Gordon Back, and will also play alongside Mali’s Grammy Award-nominated duo Amadou & Mariam, known as "the blind couple from Mali." The 2016 Menuhin Competition will take place April 10-17 in London.